We think you’ll find us a pleasant surprise. We understand the frustration of preparing for a trade show. It requires the genius of Picasso’s creativity with Martha Stewart’s party planning skills. Since 2002, DisplayStar has been helping companies tell their brand’s unique story. 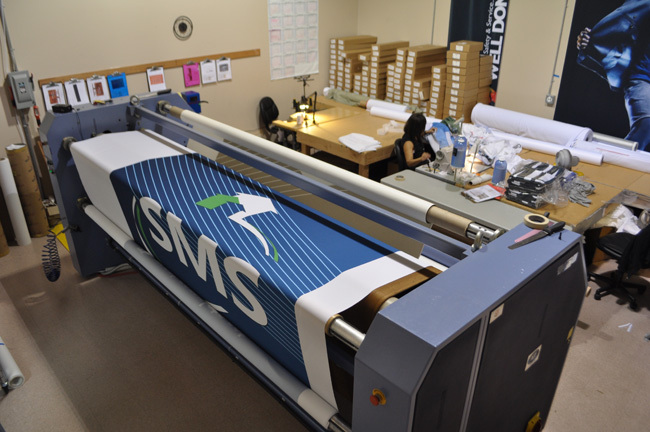 Under one roof in Beaverton, Oregon, we specialize in accessible, personalized service—along with large-format, dye-sublimation fabric printing and portable displays. We also offer in-house design and custom display fabrication. It’s 6 a.m.—dark and raining. The ten foot wide rotary heat press has begun warming up. Chiming in are the large format printers, sewing machines and a dozen phones ringing with west coast and international callers. Above: It’s 6 a.m.—a 10 ft. wide rotary heat press begins to warm up. Before the end of the day, DisplayStar will ship over 50 displays. Before the end of the day, over 50 displays will be shipped. Per year, that’s approximately 12,000 displays. It’s also one million yards of fabric. Each display has a typical turnaround of three days—with industries ranging from multi-national corporations such as Nike to non-profit art, Alvin Ailey Dance Theater, to retail outlets, Ben & Jerry’s Scoop Shops. At DisplayStar, the day begins with the morning meeting where production, design and customer service review all projects. It’s an opportunity for everyone to get together and cast a safety net for the customer. The team troubleshoots any unforeseen problems with workflow, deadlines and logistics. After the meeting, everyone gets back to work, with customer service, graphic designers, IT, engineering and marketing heading back to the front office bullpen. Including Terry, DisplayStar’s President, whose desk resides in the middle of the bullpen. Terry first ran DisplayStar from his garage. After earning his MBA in International Operations, he was successful in the corporate world, but chose to venture into running his own business. During the technology boom, many believed that in-person conferences would be replaced by webinars and video conferencing. Thankfully, Terry saw the potential in the market. His instincts have now been confirmed as the conference industry is back on its feet and growing. Ironically, it was the same people who switched to webinars and video conferencing that were the first to acknowledge its shortcomings. It was cold and impersonal. There was value and importance in meeting in person. Meeting in person was, in fact, the best way to build trust. Furthermore, it is due to technology’s ability to dramatically increase the speed of information that has left many “unsettled” as we struggle to keep up in our fields. Conferences, however, provide the ultimate venue for maximizing learning and networking opportunities. New printing technology, techniques and materials have opened up the world of signage. In particular, large format printing is venturing into more environments with new applications: Window films, car wraps—even building wraps. Above: Large format printing, DisplayStar’s specialty, is venturing into more environments with new applications. Previously untapped space—sides of buildings, store fronts, transit stations—are becoming the perfect unexpected places to catch the attention of end-users. 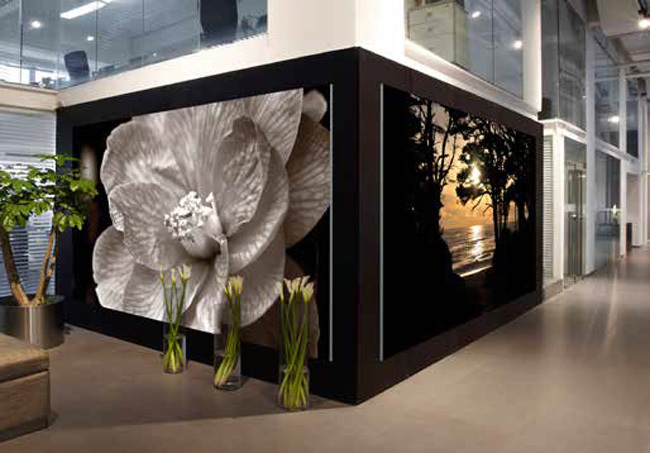 For indoors, most popular is SEG frames and light boxes with dye-sublimation fabric graphics. Dye-sublimation printing is great for capturing the fine detail and complex tones of photographs. With its high 1080 resolution, images retain their clarity at very large sizes. Backlight the image with LED lights, and you have light boxes with maximum visibility now seen in airports, corporate reception areas and mega retail malls. Above: For indoors, most popular in new signage is SEG frames and light boxes with dye-sublimation fabric graphics. Above large format dye-sublimation in SEG frames adds warmth to a corporate reception area. Even more traditional display products such as feather flags, street pole banners and tents are being reinvented with new materials and printing techniques. They too are taking residence in new places such as hotel foyers, company cafeterias and event venues. 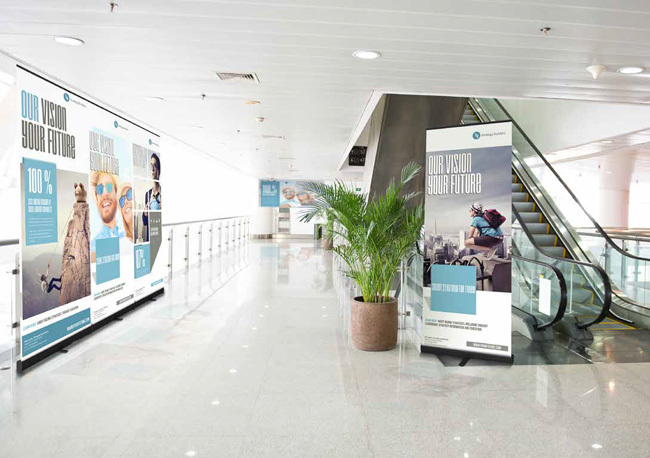 Above: Even more traditional display products such as retractable banners are taking residence in new places such as airports, walkways and mega retail malls. Business acumen aside, Terry’s real talent is hiring people that naturally excel if allowed to do what they are passionate about. He understands how to empower his employees, giving them ownership of their jobs and a stake in the success of the company. This is the foundation of DisplayStar’s excellent customer service.